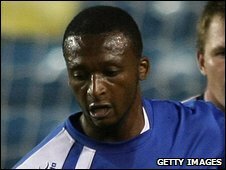 Charlton have signed Leeds striker Tresor Kandol and Wolves defender Darren Ward on loan until 3 May. The Addicks have been forced to bring in reinforcements, after Jonathan Fortune and Andy Gray were ruled out for the rest of the season. Charlton manager Phil Parkinson told the club's website: "We needed some defensive options, so I am delighted to get Darren. "Tresor is very hungry to play, so we are pleased he is on board." Kandol, 27, spent the first half of the season on loan at Millwall, and scored eight goals in 16 league starts for the League One side. Centre-back Ward is no stranger to south London, having spent four years at Millwall and two years at Crystal Palace. The 34-year-old had just returned to Molineux from a loan spell at Watford, where he made nine league appearances. Both new arrivals are expected to go straight into the squad to face Burnley at Turf Moor.